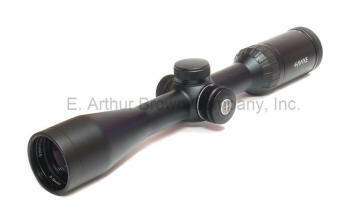 Hawke Riflescopes - Hawke Sport Optics are Quality Riflescopes with Ballistic Reticles and Repeatable Settings. Was $229, Now Only $99! Was $259, Now Only $149! - The programmable 223/308 ballistic reticle makes this scope ideal: The "ultimate" aiming solution for AR15 and AR10 rifles. Use the pre-sets with factory ammunition or, download the free app to program the reticle for any other cartridge. 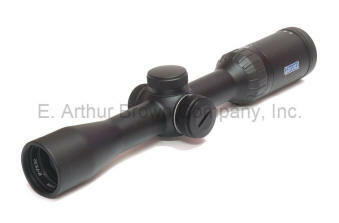 3-9x40 is just about the "ultimate" all-around magnification and light gathering configuration, too. Combine all of that with Hawke Endurance Riflescopes quality, and you have the Ultimate AR Riflescope for AR15 and AR10 platforms. Brand new, in original packaging... Blowout Priced! Orig $259, Blowout $149... Save $110! Lower Priced Competitor! Call toll free 800-950-9088 for a verbal price quote. A Special Review by Eben Brown, E. Arthur Brown Co, Inc.
Optical Quality - Hawke's engineers developed a new "broad band" lens coating that captures the brightest image without sacrificing clarity and resolution. They call it True-View coating. The lenses themselves are individually selected and matched to give edge to edge image clarity. Then during assembly, each lens set is inspected repeatedly to be sure the target image stays crisp and clear through the full range of magnification. Mechanical Quality - "Repeatability" is critical in riflescopes. Not just the windage and elevation adjustment, but also the point of impact throughout the scope's magnification range. Hawke's innovative reticles and computer programs require their scopes to be repeatable in these areas. So, they developed construction methods and quality control that assures it. Hawke IS Mechanical Quality. Check Out Our Hawke Video Library! Calculates the aiming points on your Hawke ballistic reticle in yards or meters. You enter the velocity and trajectory of your cartridge and BRC calculates the aiming points. FREE SHIPPING Plus 20% Wider Field of View! SR Pro and Half Mildot Ballistic Reticles - Three time World Champion field target shooter Nick Jenkinson designed the SR Pro Reticle system that's featured in many Hawke riflescopes. Or, you can get the Half Mildot Reticle... Both are Ballistic Reticles you can program with Free BRC Software. Waterproof, Fog proof, Shock Proof - The SR reticles themselves are glass etched, which is 10 times stronger than wire reticles, withstands magnum recoil and never fails. Hawke lenses are mounted to withstand recoil from both magnum centerfire and magnum spring airgun rifles... doubly reinforced. Filled and sealed with nitrogen and o-rings to keep out moisture, retain lens clarity. Additional Features - Hawke riflescopes have a fast focus eyepiece to easily focus the reticle to suit your eye. Positive and repeatable 1/4 MOA windage and elevation is due to precise machining of the mechanism as well as high tensile beryllium erector return springs. Lifetime Warranty. When we introduced Hawke Scopes to the internet, the idea of doing videos was pretty new. This is our Hawke Scopes Video. Read about the programmable SR reticle, then Download and try the BRC Software that programs it. Popular Hawke Riflescope Downloads - Specification Charts, Software, Etc.